Ferja is band of four guys – Elvar, Aron, Hafþór and Valur. They come from Höfn – the town at south-eastern Iceland, with the landscape filmed in such movies as Batman, Tomb Rider or James Bond. Ferja plays for 2 years. They’ve released one album – „A sunny colonnade” and one video – „The finest hour” filmed in Poland. I’ve found it very interesting, but the band was quite enigmatic. There was lack of information about the band in the Web, so I’ve decided to make an interview. It was a perfect moment to do that, because Ferja is planning they goals for 2012. And… to my surprise they’ve recorder a special, acoustic live performance dedicated to us! Bartek: Helo! How are you doing guys? Ferja: We are really good thanks! We are seeing the light of day for the first time in a few days, there has been a blizzard here in Reykjavík and it ruined Valur‘s shoes. Ferja: Correct, what we did in the beginning was to try to describe us in some cool fashion, and in a hurry Valur put together some really poetic text, but after a while we realized that it wasn‘t saying anything about us, but there is a reason why we have seemed a bit enigmatic in the past.The band now consists of us four guys. Ferja was formed in late september 2010 when we (Aron, Valur, Elvar) Had some material we wanted to take a look at, around that time we had no intentions of really forming a band and go public with the stuff, but only 2 months later we were pretty eager to put the songs on an album so we planned to record the very next spring in 2011, and Haffi the genious who is now our drummer recorded the album, so it was really a progress recording an album and then getting to know Haffi, in the end it all added up, during the recording of the album he was already as a fourth member of the band but it took some time before we fully realized it. We all come from a fishing town called Höfn, the distance between Reykjavík, the capitol is about 450 km and the only transportation available to travel between those two places is with automobile a domestic airline whose tickets cost more then our whole album did to make. So traveling back and forth in a car for 5 hours each ways is not always so easy, especially in the winter time, since the weather here can get pretty hectic. Valur and Aron have had to pinball between the places for the past years to either work or be in school and after Valur decided to take one term in school at Höfn last fall following up on the album and playing live was not an option, the band being 450 km apart and all. During that time the band was on a rest. But now that we have all moved to Reykjavík we are currently figuring out what we are as a band and our plans with the future, and correcting and rewriting obsolete information about us on the internet is certainly a step towards that. Bartek: You have written in your bio, that three of you met and „experiment musically in the darkest hour of the Icelandic sea-mist”. But the music you guys play isn’t dark at all. How would you describe your sound and what inspires you? Valur: Haha, im probably the only one who thinks the music is VERY DARK, maybe not in terms of sound but the premises of the lyrics. But there is indeed a light at the end of the tunnel in all of them and that to me sums up the whole concept of the album i guess. It‘s like a dark room and you have to know how to change the lightbulb to be able to see. Right now i have no idea how to describe our sound but what really inspired me during the recording of the album were artists like Radiohead and Philip Glass, and i also listened alot to the works of Johannes Brahms. Right now I‘m obsessed on strings, i hear violins everywhere and wish that i had a string quartet in my basement so i could record them play anything i put down on paper for them. Elvar: Who is to tell what is dark or not? Its been said that its always the darkest before the dawn, maybe our music is that glinch of hope. The influences are everywhere really, what you listen to, what you see, the weather, feelings… What basicly tried to do was to make simple but at the same time melodic music, melodies that cut to the core. My inspiration are minor chords.. i play one minor-chord that takes me somewhere in a circle that repeats itself, and ofcourse a glass of redwine doesn‘t hurt. Aron: Personally I get inspired by working with Valur and Elvar, I don´t like writing music on my own. The purpose of writing and playing music is to enjoy it with other likeminded people. Also coming from a heavy metal band, Ferja was a nice break from doom and gloom, my goal with Ferja was not to be another melancholic indy band. Bartek: You are one of the very few icelandic bands singing in English. Why you’ve decided to do that? Elvar: Probably sincerity. When i write in Icelandic i have a hard time being sincere in writing the lyrics, and they sort of become pretentious. Valur: I have been thinking a bit about this.. when we started to write in 2010 all the songs came out in english without any of us thinking about, it was natural.. i have no idea why.. but music is universal and it should not be a question of what language you end up using. Aron: You´d be surprised, there are quite a few of them. For me writing lyrics in english is just much easier. Bartek: As I’ve mentioned before, I’ve discovered you quite late thanks to Icelandic Cinema Online. That’s where I saw „the finest hour” video and… to my surprise it was shot in Poland. How does it happened? Do you have any polish connections? Valur: My brother and his wife are currently studying in the Polish national film school in Łódź and they shot the video there. Then some edits of the video went back and forth over the seas so it was a pretty remote collaboration, so we probably have a place to stay when we come to play there. 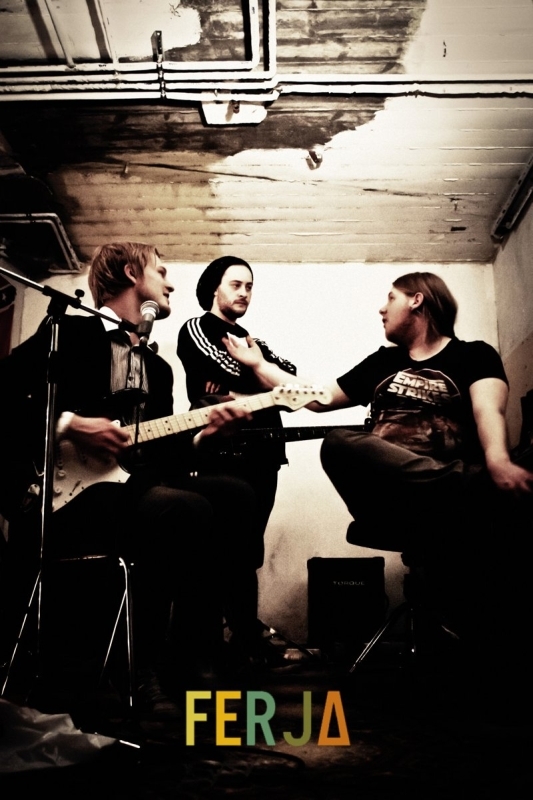 Bartek: Your debut album – „A sunny colonnade” has been released in the middle of 2011. Thanks to gogoyoko people can buy it digitally everywhere in the world, also in Poland. Everyone can also listen to it for free. Who would you recommend this record? Is this the musical path that you want to follow in the future? Elvar: Everyone.. If you take a look at all the biggest bands right now there are always big changes between the first and the second album. Is this a style that we want keep? Of course, but you never now how we grow up musically and where that will take us. Aron: I wouldn´t say it´s the path we´d want to follow, rather the path we´d like to evolve from. This album was a great experience but was a stage in our life as a band and trying new things is just a part of evolving. Valur: I would recommend this album to old women, they need some shimmering guitars in their lives and are too often left out of the rock scene. But when it comes to our future stuff there are definetly some elements of the album i want to continue exploring but im afraid some of them i will have to let go. Bartek: We’re talking at the begining of new, 2012 year. What plans, guidelines, dreams has Ferja for the next 12 months? Ferja: We just got a drummer in the band so we have to practice alot and that might take some time from us for the next month or two. We just want to rehearse right now. But our longterm plan was to try to get some talented DJ‘s on our side to remix some of the songs from „A sunny colonnade“ and hopefully to release them in beginning of summer. We have a bunch of material that we really want to take a look at, but we have to rethink some things before we make a new album in terms of the method. „A sunny colonnade“ was not even half-made nor rehearsed before we recorded it. That‘s something we dont want to do again. We put alot of pressure on ourselves and each other, we were practically flying blind because the songs were being born in the studio, where we had limited time and of course no money. We wont do that again. Bartek: I hope that we will have an opportunity to see you live in Poland and that you will find a huge number of fans in our country, just like many other icelandic bads did. One thing is for sure – you already have a few fans between the editors of muzykaislandzka.pl! Pozdrawiamy – Aron, Valur and Elvar. And here you can watch „The Finest Hour” video. Music by Ferja, from the album „A sunny colonnade” released 8th of July 2011.